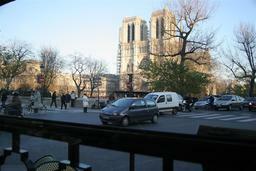 Paris is for me the quintessential Western European city and I for one have fallen prey to its charm. Before going there, I read a lot about this city. Everyone was raving about how great, how marvelous, how charming it is. After a while I started to get tired. Give me a break! I said to myself; it's only a city, how great can it be? I arrived in Paris and I was caught into exploring the city and didn't think about this at all. A few days later while I was drinking coffe at a small cafe on a side street I realized that I'm already caught in its charm. I love it here. It's great and marvelous and charming and I just love it. Paris is the glory of the French and European civilizations. Paris has everything I want in a city, architecturally, gastronomically, artistically & socially. It's full of life and culture and is a remarkable city to visit. In two trips and 20 days there I've barely scratched the surface. There are still dozens of places I've yet to discover. It doesn't matter if you travel in style, or you are a backpacker. Paris is so lovely and diverse with many things for everyone. Anyone can experience the rich history, the unique charm, the people, the sights & sounds of one the world's most beautiful cities. I don't understand the people who complain about it being dirty. Ok, maybe it can be a little cleaner, but after all, this is a real city and not Disneyland; a real city...the ultimate urban experience :) A perfectly walkable and safe city. I won't go into the sights to see in this intro, because they're just so many and usually well known. Everyone has a favourite place. Whatever makes you happy in the end, and that's what this city does for me. I'll never tire of going to Paris, a city I could easily go back to endlessly, roaming around, revisiting the Notre Dame and the Louvre, looking in windows, going into cafes, tasting the food, laughing at the miniscule rooms and feeling at home because it feels so familiar.